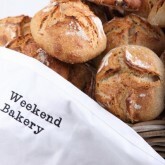 I put the spelt loaf in your handbag darling…have a nice day at the office! I wasn’t always a keen consumer of breakfast. But that was many moons ago. With the discovery of homemade toasted muesli and things like porridge with apple and cinnamon I now go to sleep at night, looking forward to my morning munch moment. So I like to wake up slowly and make my breakfast in a relaxed way, not in a hurry. But sometimes you look at the clock and you know you have to fly and you know you’re off to a bad start. ‘Grabbing something along the way’ usually results in horrible food choices at gas stations! That’s one of the reasons I came up with this bread recipe. If I can’t have my muesli moment at home I will put it in a loaf and take it with me! It’s my special pleasure to think of a combination that’s equally great in texture and color as it is in taste, aiming to please all the senses. That’s also why I chose the cherries and pistachios for the filling, but you can concoct your own filling of course. 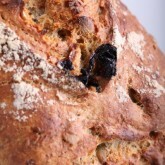 The fruit, nuts, seeds, flakes and yogurt, together with the whole spelt this makes for a happy healthy bread on the move. 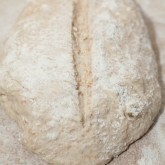 And did I mention the ‘no need to knead’ part? A bit of stirring, a bit of fridge time and a bit of folding and shaping, that’s it. 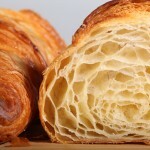 A satisfying result for both bakers and eaters I hope. 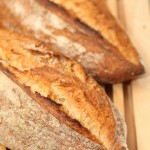 Our ‘bread testers’ (men, women and children) told me they loved the taste and texture. Let me know what you think! This recipe is easy and quick and requires no kneading. Put all the ingredients in a bowl and mix well with a spoon or a spatula for about 1 minute. 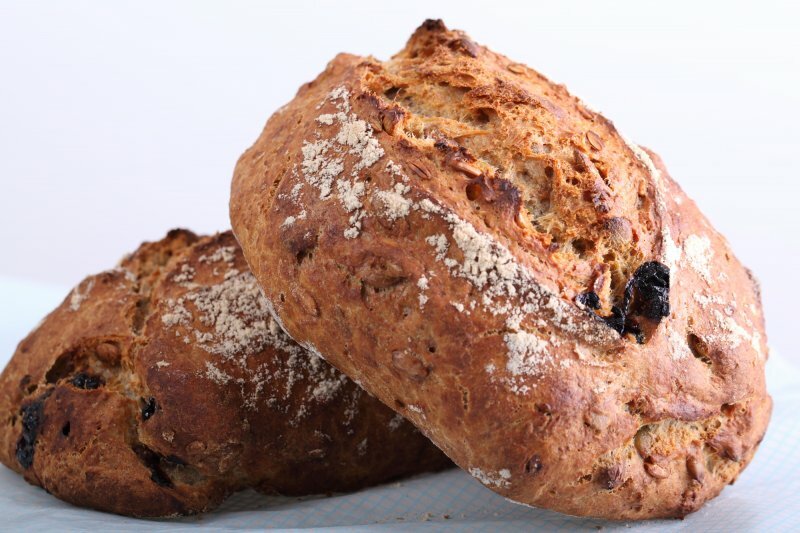 Of course you can be creative and add your own muesli mix of dried fruit, nuts, seeds and make it your own favorite loaf. The amount of moisture in this recipe makes for a rather sticky dough. It’s meant that way but if you want it less sticky I suggest you put in a little less water (25-50 ml less). Cover the bowl with clingfilm and put it in the fridge until the following day. Preheat your oven at 220ºC / 430ºF. 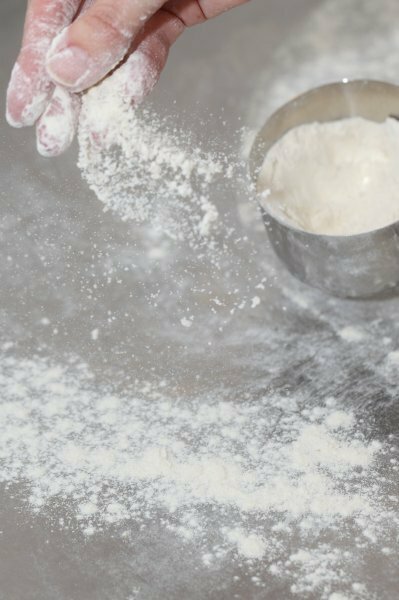 Take the dough out of the fridge and turn it out onto your floured work surface. 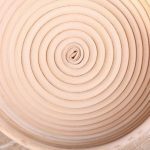 We are now going to give the dough one or two stretch and folds (see pictures and also our bread movies on the subject) to develop it a little further. Cover and leave to rest for 30 minutes. 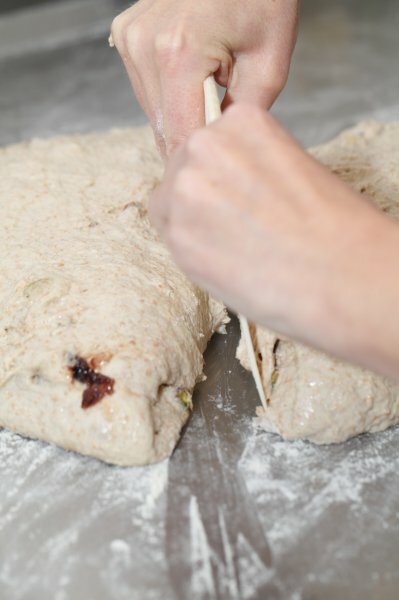 Divide the dough into two equal parts and shape them as you like. 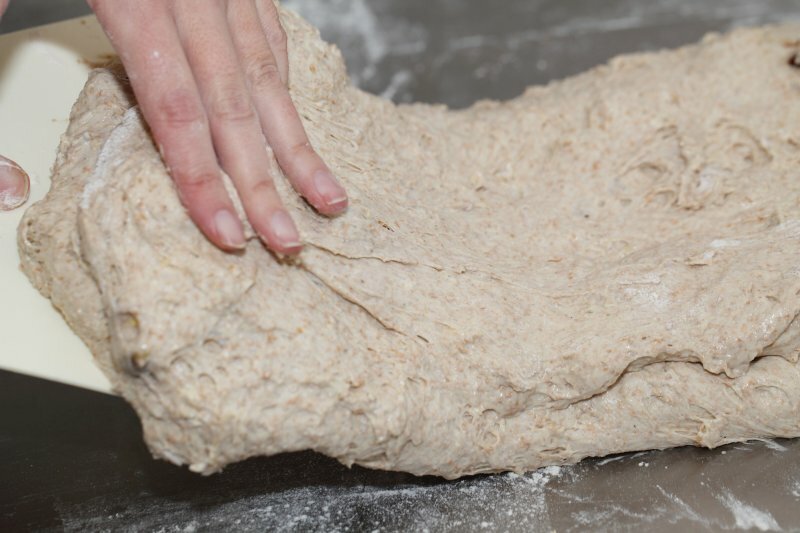 I quickly and very roughly make oval shaped loaves, I fold it to give the loaf some tension and then roll it carefully with both hands to get the required shape. Slash the top of the loaves with a lame or bread scoring knife. To get a nice crust, try to create some steam in your oven by putting a small metal baking tray on your oven floor when you preheat the oven and pouring a half cup of hot water immediately after putting the bread in the oven. Release some steam by setting your oven door ajar (perhaps with the help of a wooden spoon or oven mitt) 5 minutes before the bread is ready. If you are going to create steam with a baking tray, you maybe also want to turn your oven temperature a bit higher, because you are going to lose some heat in the process. Bake the bread for 35 to 37 minutes. Leave to cool on a rack. These loaves keep well in the freezer. You can slice them before you put them in, grab a few slices in the morning and take your ‘breakfast in a bread’ with you. The recipe will give you two loaves of about 500 grams each. Of course you can make one big loaf or 4 handbag size ones of 250 grams each, but make sure to adjust your baking time accordingly. 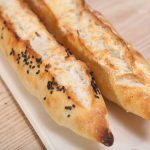 Alternatively you can skip the whole stretching and folding, shaping and resting part of this recipe and immediately bake the bread after you get the dough out of the fridge. Just cut the dough into four pieces and whack it in the oven and bake for 27 minutes. 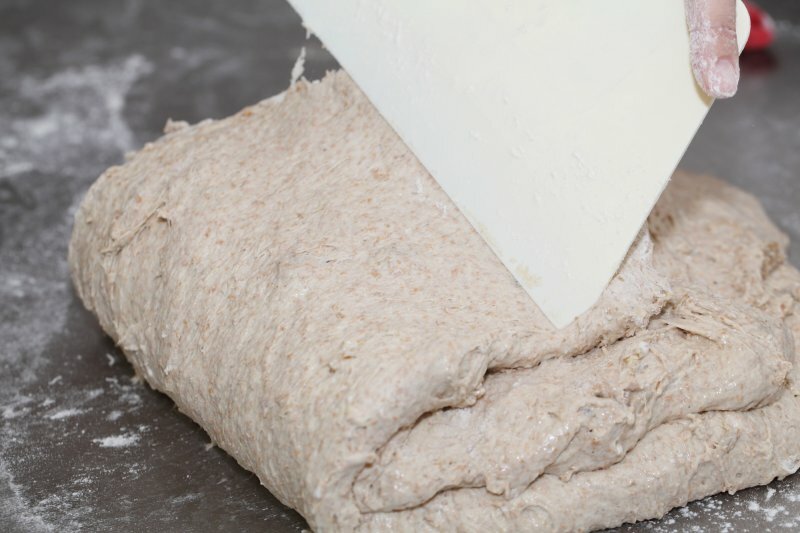 This way you will end up with a much flatter bread, but it will be a very quick way to make bread and equally tasty. For more inspiration on easy bread also visit the virtuous bread website. Hi! 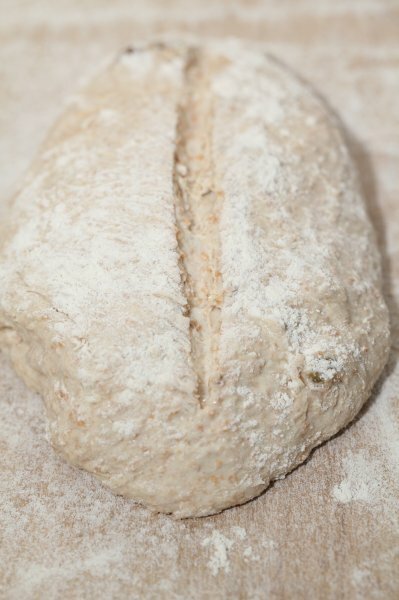 Saw a comment that you were going to try this as a sourdough…would you or did you use the same procedure or mixing all together and putting in fridge overnight? It has been a while, but we did make this loaf with sourdough. Every culture acts different but a good starting point for us would be to add 30 grams of active culture to the recipe. 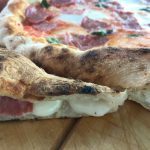 Could be you might need a few rounds to get it right for your conditions, and the taste, texture and crust will be a bit different, but we hope it will be great! I’ve been making this bread or a variation of it now for a few months with just 30g sourdough starter and no yeast. It’s so much fun to play with variation and different flour combinations/add ins. I don’t put it in the fridge and leave it in a warm spot overnight. I try to do a 2-3 stretch and folds in the morning depending on my time but there’s been times I skip them altogether. This is my busy mama (twin boys and infant) sourdough variation that I needed. So great to read your comment and learn about your method and the success you are having with it. Thank you for sharing and it will inspire others to try this busy mama version too we are sure! I tried this recipe as an experiment since I have always had a total disaster with any bread I’ve made with spelt! It turned out tasting really delicious. Since it was an experiment, I used golden grain flour as my complement to the spelt bread (so lots of extra seeds) and raisins and walnuts. 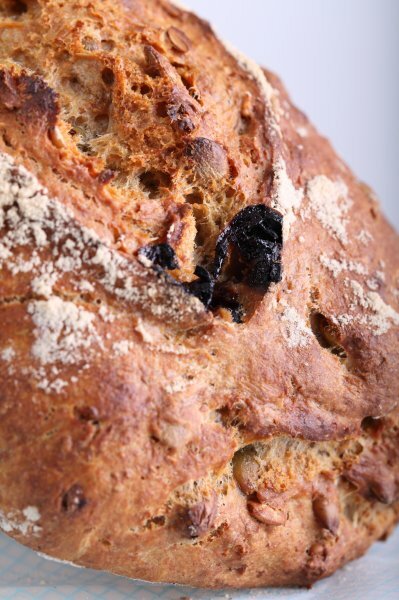 Next time I will keep with the golden grain flour but put in extras that I actually like…..maybe dried apricots, hazel nuts…..opportunities as endless! Thank you for liking it so much. My brother actually makes this recipe with apricots and nuts every week and it is a firm family favorite. 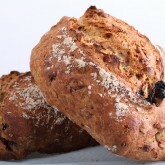 Is there any way to substitute spelt four with wheat or rye or semolina? It’s almost impossible to find spelt flour where I live. And if I were to incorporate some regular bread flour, what would be the best ratio? You can use 250 grams whole grain wheat flour or also use bread flour if you cannot get the whole wheat. 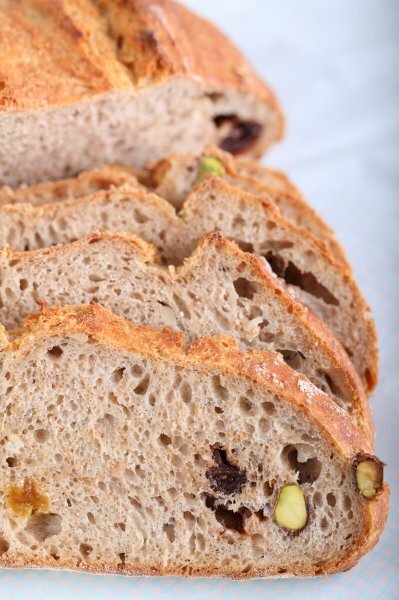 When using only bread flour you can use a little less water (300 ml would be our suggestion to start with). I tried this recipe and it was the best bread I had ever tasted but I had to add 50 ml to get the consistency needed to be able to stretch and fold it, guess that goes to show how wildly varying different flours can be. For the third time I tried this recipe I varied it up and made a poolish out of the spelt flour and combined all the ingredients the morning after with 400 ml total of water and only 3 extra grams of yeast and then did about 4 stretch and folds with 45 minutes in between. Then for the final proofing I simply shaped the loaves and put them into a cold oven with some water in a pan in the bottom and set the oven to 225 degrees for 45 minutes. And boy let me tell you that is the best bread I have ever made by far, amazing flavour and texture and it’s nearly all methods I learned from this site so I just wanted to say thank you for transforming my bread baking! Oh yes, I forgot, I use greek yoghurt instead of normal yoghurt. Thank you so much Martin for your lovely comment and the details about how you made this recipe your own. The possibilities with this recipe are endless and you never get tired of making it we think. The greek yoghurt has much more fat and for that reason also less moisture, which might also partly account for you having to add more moisture, but you are very right, flour plays the main part. 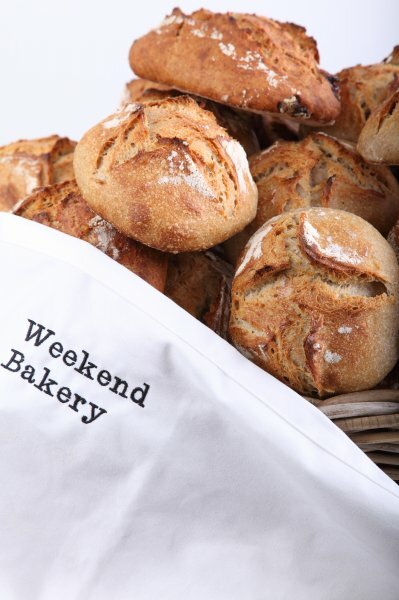 Wishing you many more tasty loaves and happy baking moments! Kefir lovers: this recipe is easily converted into a yeast free sourdough version, just mix half the flour with an equal amount of kefir and leave it out of the fridge for 24 hours, then put in the rest (less water and no yeast) and leave again out of fridge for an hour of 6/8.. then you can shape of do some s & f..I tried this with some slap and fold, and without, more and less water and as Marieke says, all equally tasty. I used Doms Kefir pizza bread method as a inspiration, but also did a hybrid a la the 70% rye on this site with 2 grams of yeast and 1 hour rest after the 24 hour fermentation.. I prefer less hassle and a denser bread in the end. Great recipe thank you! It really reminds me of Holland. Just baked this bread this morning after its sleep in the fridge and it came out fab!! It tastes lovely too – nice and soft and not compact at all. 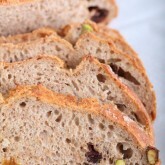 I used sunflower seeds, raisins , hazelnuts and a few chopped dates, cranberries and dried apricots. Thanks for another great recipe – much appreciated! You’re welcome! Your selection of ingredients sounds heavenly. Sounds like it turned out exactly as it should be. I made it today and the result was fantastic! 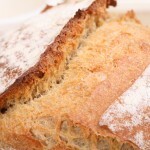 Easy to make, nice bread to see and the taste is fabulous! I’ve made bread with spelt flour before and the structure was very dense and not tasty but the result of this bread was great! From now on if I want to make spelt-bread this is the recipe for me. Thank you so much for posting it on your website. Thanks for the feedback and for liking it so much Carla. 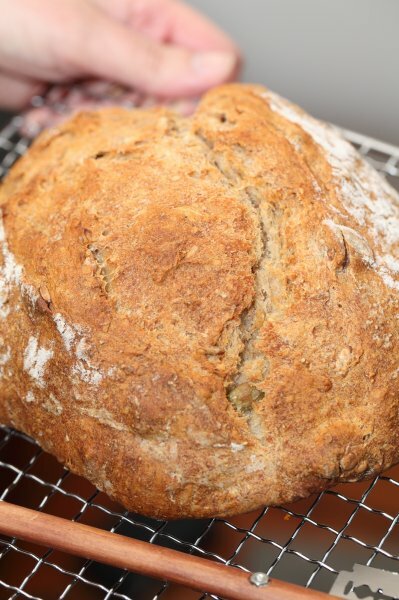 You can bake this bread in a loaf tin too! I’ve used a tin of 30cm to make one big loaf. After getting the dough out of the fridge, I did the two stretch-and-folds and formed a loaf shape, put in a prepared loaf tin. Let it rest in the tin for 30 min. The rest of the proces according to the original recipe. Bake for 40 minutes and I had a beautiful bread with a nice crust on top. When I bake my bread this way the end result is a higher bread then “free form” but the taste and crumb inside the bread are the same! The hardest part of the bake is every time the cooling period! Hello Carla, this is a very good idea. When using a baking tin you can also stretch the final proofing to 90 min – 120 min, this way you get an even fluffier structure. The sides of the baking tin will help the bread and keep it from collapsing. Happy baking! Geweldige site! 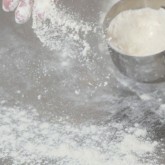 Kan de wheat flour vervangen worden door spelt flour? Ja dat kan, ik heb het nog even erbij gezet. We zouden wel aanraden een combinatie van speltvolkorenmeel en de lichtere speltbloem te gebruiken voor een mooie kwaliteit kruim. Met alleen spelt volkoren wordt het wel erg zwaar en compact. I have the same question but pls answer in English, can I use wheat flour instead? Yes Shaimaa, no problem to make this recipe partly or only with wheat flour. How do you think Muesli cereal would be be incorporated, still using at least the pistachios and cherries? I think it could work, but have not tried it myself. Something like the cereals from the Dorset brand maybe? Really like this recipe, but the yogurt I can get here really isn’t suitable to put in the bread, would it be possible to change it for milk powder and some more water? If so what would be a good ratio? Yes, I think that is no problem. I would use a little bit less liquid (I think around 25 to 50 ml less) but I have no experience with the use of milk powder I must say. So just give it a try. 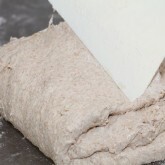 The dough should be very moist and there is very little handling of it involved, only a bit of S & F and quick shaping. Hope this one turns out delicious too. Thank you for the link. I have always loved your site and this comprehensive and easy to follow recipe is no exception! Kan ipv de Dutch Oven ook een emaillen Hollandse braadpan gebruikt worden? Bedankt voor al die super-broodbak-lessen! Dank je! Ja een zware braadpan (die lijkt op een le Creuset pan) werkt heel goed, als er maar geen grepen of knoppen aan zitten die niet oven-bestendig zijn (smeltgevaar!). Yummy looking bread! I really want to give it a try. 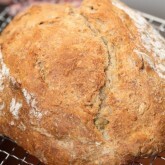 What is your comment on using a dutch oven for baking this bread? I am bit scared creating the steam by placing a pan in the bottom of the oven and pouring the water (i dont want to damage my new oven!!) I was doing some research on creatung steam in the oven and found that a dutch oven can be used to get a good crust on bread. What is your opinion? You are right about being careful with your new oven. Placing a pan on the bottom would be a safe option compared to spraying water on the walls of your oven. You can only do this if you are really sure your oven can take this kind of ‘battering’ (like we know our Rofco stone oven can, because it is built that way). So using a Dutch oven would not only be a save option, but also one that would very likely lead to better baking results because the direct heat from the pan to the surface of the bread and the steam /water trapped in the pan during the first stages of baking will make for a crustier crust and a better oven spring. It is like creating an oven in an oven. So in short it is very well worth a try. And please be careful with the hot Dutch oven and always have very good oven gloves ready so you will not by accident touch the pan or lid with your bare hands!! Not yet, but it’s on the list to do exactly that this weekend! I would use 30 to 40 grams of starter for this recipe (also depending on how active your culture is). The loaf looks great and…yummy! Have you tried a version with sourdough starter instead of yeast? 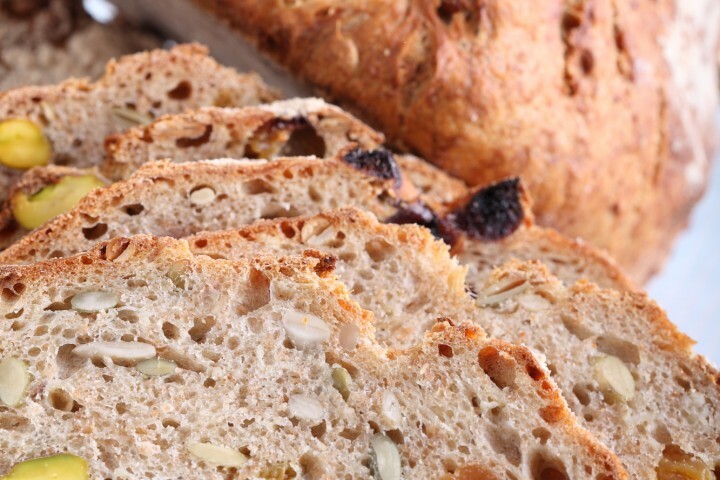 Yuuummmmyyy bread – I adore muesli in bread. Gorgeous bread! Really impressed with the results you’re getting in your little bakery. It’s all inspiring. Looking forward to more.